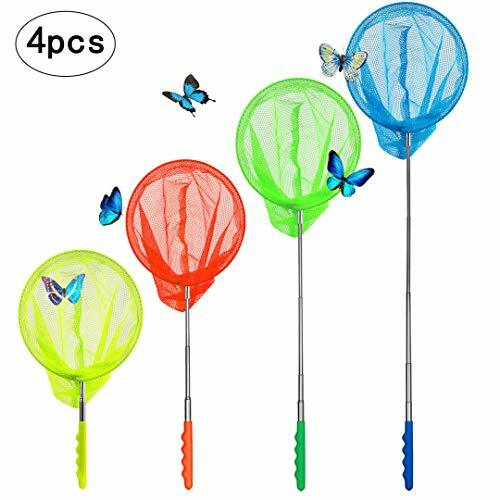 4 Pcs Colorful Butterfly Nets - The package is come with 4 pcs colorful bug and insect catching nets,4 different vivid color(orange,blue,green,fluorescent yellow),great tools to help your kids exploration the natural world. Wide Usage - Butterfly nets can be used to catch or release butterflies,grasshopper,crickets,firefly and other insect,also can be used as fishing net to catching small fish or tadpole,enough net depth without hurting them. Great Gift to Kids - Great nature exploration toys gift for kids who love catching bugs,have a fun time with themselves friends by releasing interesting insect and leave a precious memory for your kid\'s childhood. Telescopic Handle - Adjustable handle extends and retracts for convenient storage and usage.It can extend from 7 inch to 26 inch and gives you freedom to explore.And you will like the anti-slip PVC handle,as it is soft and comfortable to hold. Premium Quality & Durable - Our butterfly nets are made of high-quality stainless steel telescopic pole,PVC handle and nylon net,they are flexible & durable and non-toxic,not easily broken and rust,can be used for long time.